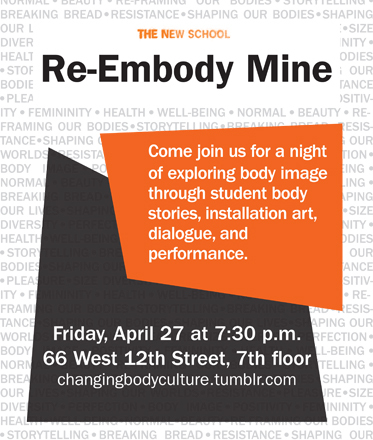 Re-Embody Mine, a student initiative to collect and share body stories about the struggle of self, body, health and society, will be hosting a one-evening exhibit to showcase student voices with original art installations by Bricollab Art Collective. The exhibit takes viewers through five different rooms which each consists of different inspiring body experiences. These narratives speak to making peace with one’s body, navigating confusing messages, and the winding journey to find one’s authentic voice within their body. This event is being sponsored by Active Minds Emerging Scholars Program, Student Health and Wellness Promotion, Bricollab, The New School for Social Research, Changing Body Culture @ New School and the Scattergood Foundation. It will take place on Friday April 27, at 66 West 12th Street, 7th floor. Doors open at 7:30 p.m. and close at 10:00 p.m. Student narratives can be accessed at http://changingbodyculture.tumblr.com/.